There have now been 6 editions of my Daily Inspirations available for download here on the AMOM blog and I have had so much fun creating them and seeing the creativity of all those that have taken advantage of them. However, as each month has gone by, I am feeling the need for change. Obviously, I want these prompts to be as useful as possible to those of you who are using them and I have found some limitations with the current format and delivery of my Daily Inspirations downloads. There have been some prompts I have not been able to share with you because they simply don't fit neatly into a tiny little square (as cute as they may be). I have been taking notes, playing with different ideas and working on a few different 'prototypes' so to speak. I am hoping to unveil the new and improved version (most likely under a new and improved name as well!) within the next few months, but before I do so, I wanted get some feedback from all of you - the users of these Daily Inspirations downloads. What do you like about the current format (pdf including grid of prompt squares)? What do you dislike about the current format? Which prompts have you found the most useful/inspiring? Which prompts have you found the least useful/inspiring? Are there any types of prompts that you feel are missing from the current format? If you have not already entered a layout for the monthly drawing, what is holding you back? You can answer one, a few, or all six, but the more feedback you can provide the better. Every insight and suggestion will be taken into consideration. It's not quite feasible for me to really give each of you a penny for your thoughts, but your opinions are sincerely wanted. 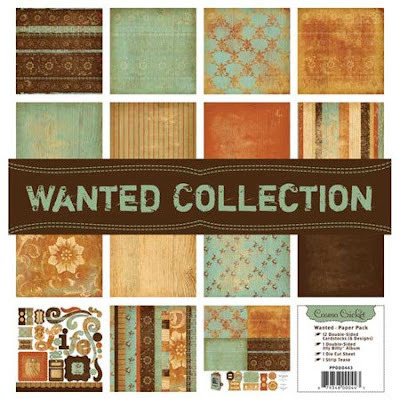 So, if you will take a few moments to let me know what you think in the comments, I will enter you in a random drawing for the complete Wanted Crafting Kit by Cosmo Cricket!! Please leave a comment with your thoughts on the above questions and be sure to include your name (first name only is fine) and email in order to be eligible for the drawing. I would like everyone to have sufficient time and opportunity to contribute, so I'm going to leave this drawing open through next Monday, July 20th, 11:59 p.m. However, even if you miss the drawing deadline, please feel free to comment even after this date if you wish as your opinions will still be greatly appreciated! Thank you in advance and I can't wait to here what you have to say! !